Gremlins, Part 2: Bones 3 Figures | H.A.W.K.S. 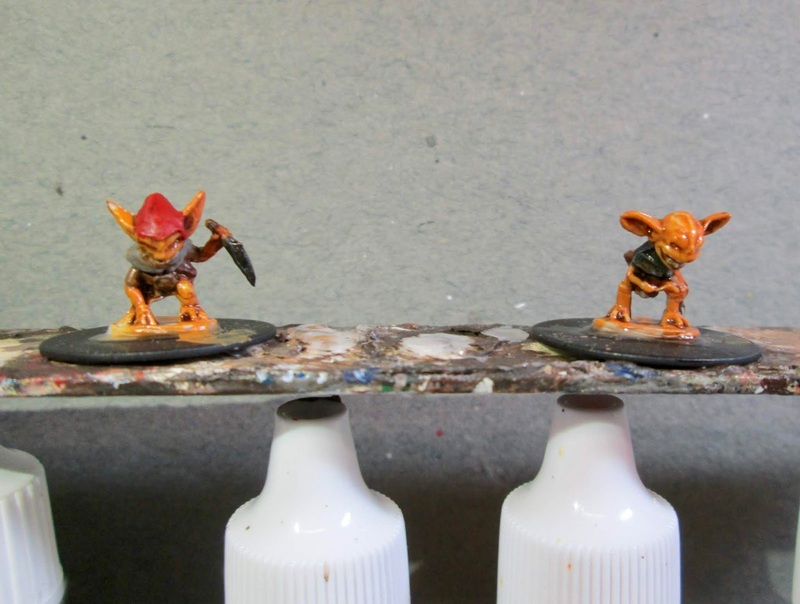 This past week I again continued making my way through the last few figures I have from the Bones 3 Stoneskull Expansion, and painted the remaining 2 Gremlin figures. 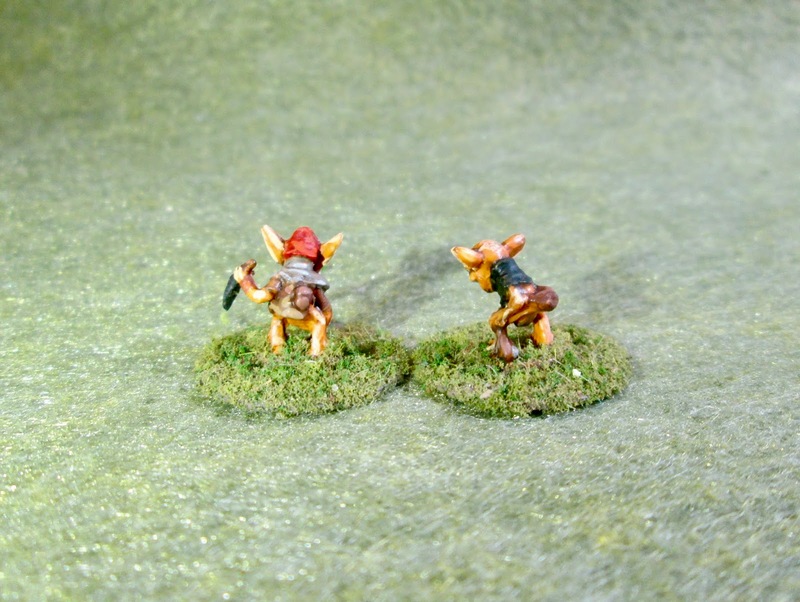 There were 4 of them in the set, and I painted the first 2 back in October: Gremlins, Part 1. 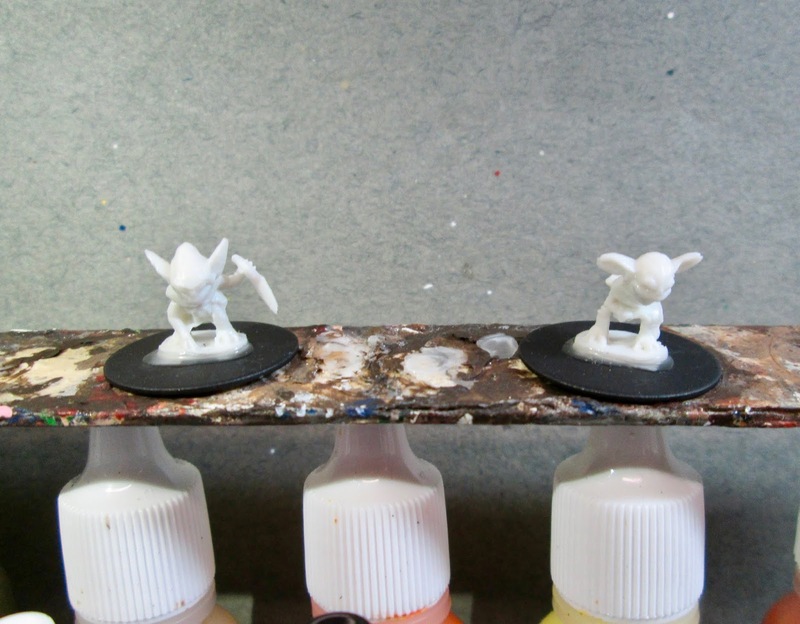 This week I was frantically getting figures ready for a Cold Wars playtest game I was running at Friday’s club meeting, (See: WotR Playtest) so I thought I’d work on the Gremlins since they were small simple figures to do. I began by painted the both entirely with Accent “Golden Oxide”. I then painted the lefthand one’s clothing using Reaper MSP “Olive Skin Shadow” for his tunic, Americana “Neutral Grey” for his collar, and Reaper MSP Bones “Cinnamon Red” for his hat. Next, I did the righthand one’s cloths, using Apple Barrel “Apple Black Green” for his collar, and the “Olive Skin Shadow” for his loin cloth. I then painted their pouches with Crafter’s Acrylic “Cinnamon Brown”, and the the knife handle and the righthand one’s sling with Americana “Raw Umber”. After that, I painted the stone in the sling with Crafter’s Acrylic “Storm Cloud Grey”, the knife blade with Ceramcoat “Black”, and their teeth with Americana “Bleached Sand”. 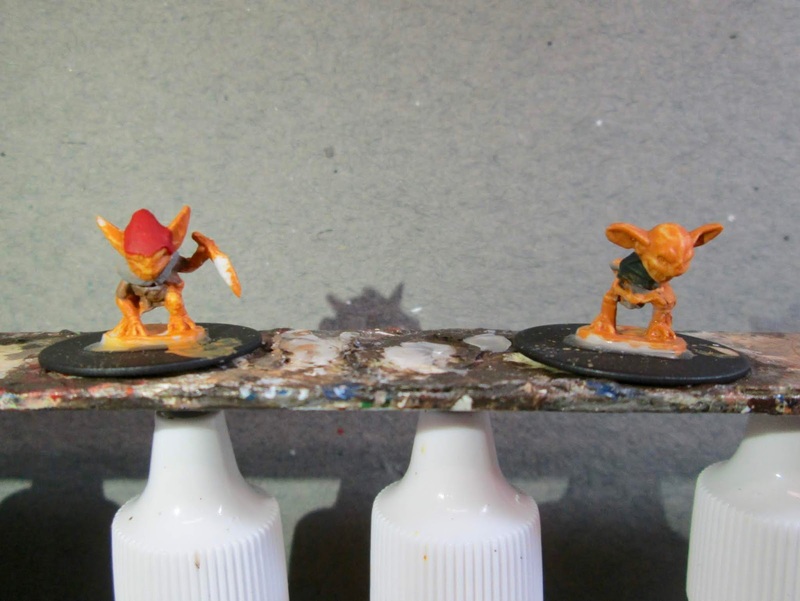 I let the figures dry for a while, and then gave both of them an entire wash with Citadel “Agrax Earthshade” wash. When the wash was dry, I painted their eyes, and then highlighted their teeth with Crafter’s Acrylic “Light Antique White”. I then highlighted their skin with Ceramcoat “Maple Sugar Tan”. 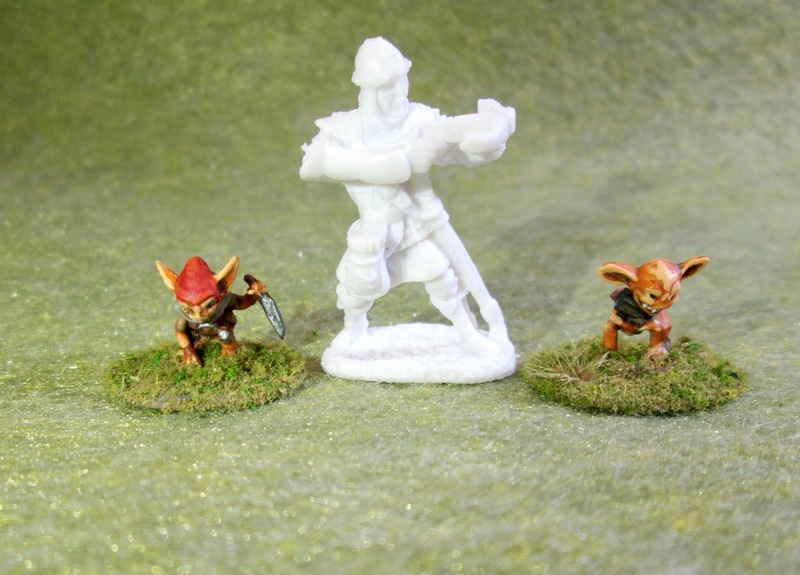 Next, I highlighted the clothing on the lefthand one using; Crafter’s Acrylic “Orange Spice” for his hat, Duncan “Sate Grey” for his collar, and Reaper MSP ‘Olive Skin" for his tunic. On the righthand one, I used; the “Olive Skin” on his loin cloth, and totally forgot to do highlights on his collar! I then highlighted the pouches with Folk Art “Teddy Bear Brown”, and the sling with Americana “Light Cinnamon”. Finally I painted the knife, belt buckle, and knee armor on the lefthand one with Folk Art Metallics “Gunmetal Grey”. Lastly, I painted the the bases with Americana “Mississippi Mud”. I let the figures dry overnight and the next day I gave them a coat of Americana “DuraClear Matte” varnish. Then, when the varnish was dry, I used some white glue to flock the bases. Another overnight dry, and I sprayed with Testor’s Dullcote". I’m generally happy with these guys, though you can tell they were a side project while working on other stuff; as I realized when I saw the photos that I had totally forgot to highlight the righthand one’s collar, and apparently forgot to paint the back of the knife blade with the “Gunmetal”! I may go back and fix these, or because these guys are so wee, I just may leave them as is, and assume no one will probably ever notice. At this point, all I have left from the Stoneskull Expansion are the Kobolds, and the Behir. (I traded off the Naga and Flesh Golem, as I just weren’t fans of those figures.) I’m glad I’m getting near the end, as Reaper announced Friday that the last Bones 4 shipping container is on the water from China, and expected early March; with shipping possible as early as mid March. I like them! They look mean little blighters! Thanks, John! I agree; for being so small, the sculptor got a lot of character into them. 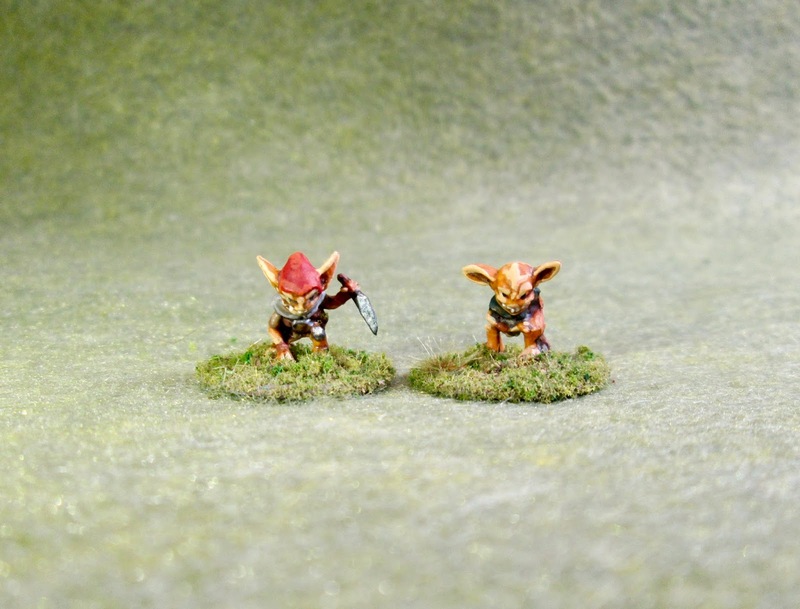 Tiny dudes with attitude. Nice work Chris!